The murder of Saudi journalist Jamal Khashoggi now seems very likely to prompt Congress to impose some sanctions on the Saudi government, and it may finally act to end the active US role in the Saudi-UAE war on Yemen. 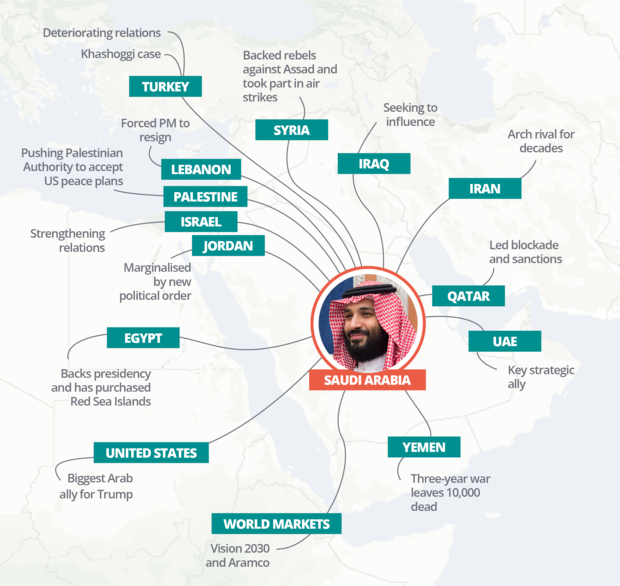 Perhaps more significantly, some senior Democratic Party figures in Congress have called for the first serious reconsideration of the whole US-Saudi "special relationship", citing the need for fundamental changes in the relationship. Such a critical reappraisal is long overdue. For decades the United States has been providing political-diplomatic cover for Saudi policies that have caused far more disastrous consequences for the United States and for the entire Middle East than any of the countries that Washington has designated as "adversaries". More than any other American ally, the way Saudi Arabia operates is completely at odds with the values the US professes to champion and embody. The Saudi ruling elite is not only proudly anti-democratic but upholds an extreme interpretation of Islam that has made it the primary source of violence and instability in the Middle East over the past decade. The main rationale for maintaining a "special relationship” with such an unsavoury regime has long been that the Saudis have assured “access” to oil at affordable prices. Many in the US political and national security elites have continued to embrace that argument, but fundamental changes in the global economics of oil – and especially the rise of the shale oil industry in the United States - have ended that former Saudi role in regulating the global oil market. The world's demand for oil has receded dramatically since 2014, creating a severe budget deficit problem for Saudi Arabia. As a result, the Saudis are afraid that any cut in production would cause the Kingdom to lose market share and benefit their competitors. The new case for the US-Saudi alliance is that Saudi Arabia is the regional counterweight to Iranian expansion. But the recklessly aggressive Saudi behaviour in Syria and Yemen has done far more to benefit al-Qaeda, destabilise the region and harm US interests than to counter Iranian influence – real or imagined. The glaring contradiction between the supposed benefits of an alliance with the House of Saud and the actual heavy costs associated with it goes back to the US-Saudi collaboration between 1979 and 1988, supporting Afghan fighters against the Soviet Union in Afghanistan. In 1979, a Saudi national, Osama bin Laden, moved to Afghanistan to join the fighters and support them logistically and financially. In 1988, he founded al-Qaeda. The Saudi regime’s fear of bin Laden's popularity among its citizenry prompted it to cover up the reality of al-Qaeda terrorism, even after it struck inside Saudi Arabia itself. But more importantly, the US government tolerated that Saudi cover-up of terrorism. In November 1995, four veterans of the Saudi jihadist force in Afghanistan with ties to bin Laden bombed the office of the program manager of the Saudi National Guard, which the US military was training, killing six American servicemen and wounding 42. That should have signaled a crisis in the alliance, but nothing happened. Then came the bombing of Khobar Towers in june 1996, which killed 19 Americans and wounded 372. FBI Director Louis Freeh, the man in charge of the US investigation of the bombing, quickly accepted then Saudi Ambassador Prince Bandar’s position that Iran was behind the bombing and ruled out any investigation of the bin Laden organisation. CIA Director George Tenet supported that decision. A former FBI official involved in the investigation revealed to this writer that when the FBI arrived at the scene to investigate the bombing in Saudi Arabia, they found the Saudi government was bulldozing the crime scene. And US intelligence intercepted secret orders from the Saudi interior ministry to provincial officials to obstruct the investigation. Bin Laden actually confirmed his network’s responsibility for the bombing in two interviews he gave to the London-based newspaper Al Quds al Arabi in October and November 1996. The leadership of the FBI and CIA nevertheless supported the Saudi regime’s claim that it was an Iranian operation, thus effectively protecting the al-Qaeda network in the Kingdom. Two terror bombings that should have ended the “special relationship” thus gave al-Qaeda the opportunity to strike successfully on 9/11. Even after the 9/11 attacks, Saudi Arabia remained the leading source of funding for al-Qaeda, as Hillary Clinton noted in a classified 2009 paper. And as the US treasury department concluded in 2008, the Saudi government was still not taking steps to halt such funding, despite the Americans urging them to. The Obama administration gave the alliance with the Kingdom new importance by responding to pressure from its Saudi allies - as well as Turkey and Qatar - with a CIA programme to support the supply of arms to opposition forces in Syria. It was a covert US operation managed by the CIA but funded by the Saudi government – an arrangement that revived a familiar pattern of past Saudi-CIA collaboration. For the CIA, the payoff was the freedom to carry out an operation that was “off the books” in terms of funding. But the cost to the interest of US in halting terrorism and to the stability of the Middle East as a whole were enormous. Al Qaeda's Nusra Front and its closest allies got a large share of the weapons, because the supposedly "moderate" forces were militarily dependent on Nusra. And the new threat to the regime of the Syrian President Bashar al-Assad eventually provoked both Iranian and Russian military intervention, which the Obama administration should have anticipated from the start but didn’t. The end result of the US-Saudi operation was to wreck Syrian society for the foreseeable future and to give an al-Qaeda affiliate a political-military foothold in Syria. Then in March 2015, the Obama administration signed on to another Saudi scheme – a Saudi-UAE air war to destroy the Iran-aligned Houthi forces in Yemen and restore a Saudi-backed government. The Obama administration not only gave its approval to the war in advance but then provided diplomatic cover for Saudi policies of preventing food and other humanitarian goods from reaching the civilian population. The result has been a humanitarian catastrophe. Yemen’s ability to function as a society will be compromised as long as the war continues. The US alliance with Saudi Arabia must be understood not in terms of normal geopolitical interest but in terms of the bureaucratic interests of the CIA and the Pentagon, which have dovetailed well with those of the House of Saud. Although US officials would not disclose the amount of the Saudi contribution to the CIA’s covert programme to arm and train Syrian opposition forces, the total effort cost “several billion dollars”, according to New York Times sources. For its part, the Pentagon and its arms contractor allies have already gotten contracts worth $14.5bn with the promise of $110 bn to come - depending on US compliance with Saudi interests. Equally important, it has gotten access to a naval facility in Bahrain (officially designated as "a major non-NATO ally" in 2002) over which the Saudis hold sway and which the Saudi regime will now certainly threaten to terminate if the US puts too much pressure on it. Those interests have been sufficient to keep the two powerful national security institutions committed to the alliance. In the wake of the grisly Khashoggi murder and the likelihood of a Democratically-controlled House of Representatives, however, a rare opportunity has arisen for Congress to act independently of those institutions and impose restrictions on ties with the Saudis that have wrought primarily terrorism and ruin in the Middle East. Gareth Porter is an investigative historian and journalist on U.S. national security policy who has been independent since a brief period of university teaching in the 1980s. Dr. Porter is the author of five books, the latest book, “Manufactured Crisis: The Untold Story of the Iran Nuclear Scare,” was published in February 2014. He has written regularly for Inter Press Service on U.S. policy toward Iraq and Iran since 2005.